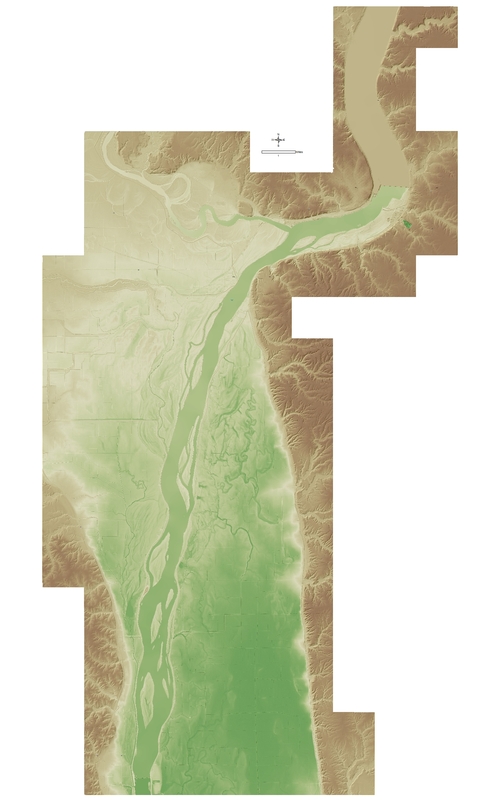 Map depicting Tier 2 Last Return LiDAR products for Pool 20 of the Upper Mississippi River System. Image created by overlaying transparent hillshade image over digital elevation model. These products were developed by the Upper Midwest Environmental Sciences Center using data developed for the Upper Mississippi River Restoration - Environmental Management Program's (UMRR-EMP) Long Term Resource Monitoring Program element (LTRMP), National Atlas of the United States and the United States Geological Survey, and OpenStreetMap which is open data, licensed under the Open Data Commons Open Database License. A JPEG version is available for viewing (p20_t2_deml2.jpg).